This Padilla stoneware sugar & creamer would make a great addition to any table decor. Padilla's drip-looking glaze is such a unique artistic touch to his designs. 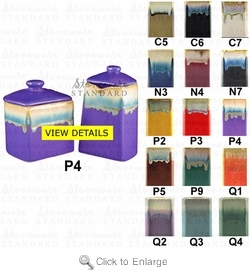 The Padilla stoneware sugar & creamer comes in 15 different colors for your selection. Approximate dimensions-Sugar (l x w x h): 8" x 4" x 5"
Approximate dimensions-Creamer (l x w x h): 6" x 4.25" x 10"